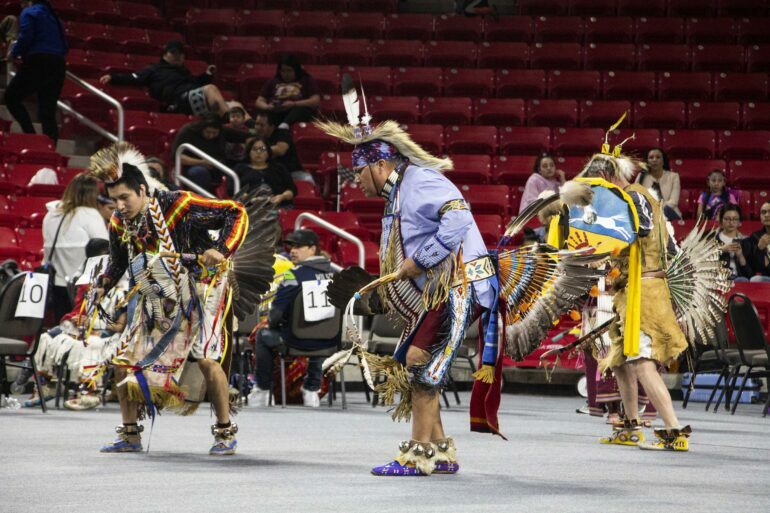 The sound of footsteps resonated in the Sanford Coyote Sports Center Saturday and Sunday, as the delicate clinking of jingle dresses mixed with the beating of drums to celebrate the 47th Annual Wacipi. Dancing is more than just a calorie burner or stress reliever for indigenous peoples. For Steve Yellow Earrings of the Standing Rock Sioux Tribe, it’s about healing when a person is hurting. Yellow Earrings began dancing at the age of eight, participating in grass dancing. He later started involvement in the sun dance at 16. Instead of finishing high school, Yellow Earrings had to drop out to take care of his children, and by 19 he was a dad of four and married. After that, Yellow Earrings began dancing again and making his own garments when he moved back onto the reservation in 1997. “I participated in grass dance specials and traditional specials and made my first beadwork,” Yellow Earring said. He would continue to participate in powwows until 2010, when a loss made him step back from more than just dancing. Yellow Earring’s relationship with his sons became strained after the separation with his alcoholic wife, despite his efforts. For Yellow Earrings, dancing is therapeutic and the drums are healing. Yellow Earrings said he’s not the only one benefitting from participating in the powwow. “There’s a lot of these older ones that can’t walk or are handicapped and they should be dancing for them, and that’s what I do–I dance for all of these people and it makes me feel better just to be out there,” Yellow Earrings said. Senior Mekko BearKiller says many people don’t know the impact Wacipi has on the community, especially the indigenous communities around Vermillion that come to perform. There are also ceremonies that are performed during Wacipi, like the Wiping of Tears ceremony that helps people in the grieving process. Yellow Earrings said before the ceremony, people would isolate themselves in their houses after a death in the family, but things are changing and powwows can bring people back from their solitude.